The Santa Rosa Children’s Chorus is a non-profit organization based in Santa Rosa, CA. It was founded in 1984 to provide the children in our community with an opportunity to study and perform choral music. Artistic Director, Carol Menke, has been part of the Chorus family almost since its inception. 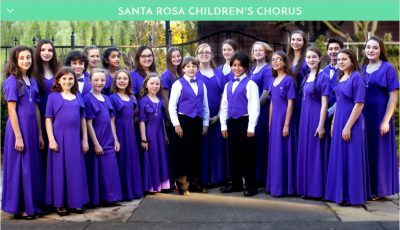 To learn more about us, visit www.santarosachildrenschorus.com. Position: The SRCC is currently looking for a Chorus Manager (Administrative Assistant) to work with the Artistic Director and the Board of Directors in the general management of the concert season. Part-Time, Hourly Position: from 12 to 20 hrs. per week. Mandatory attendance is required at rehearsals on Monday, Tuesday and Thursday from 3:30-5:45pm. Attendance at concerts and other events is also required. Some weekend and evening attendance is required. Other office hours are flexible . Description: The Manager is accountable for implementing the policies and vision set by the Board of Directors. As the public face of the organization, the Manager is responsible for presenting positive images to young musicians, parents, donors and members of the community regarding programs and the Chorus’ role in music education. The Manager ensures that the scheduling and production of the Chorus’ concerts, rehearsals, tours and special events run smoothly, effectively, and in a financially responsible manner.